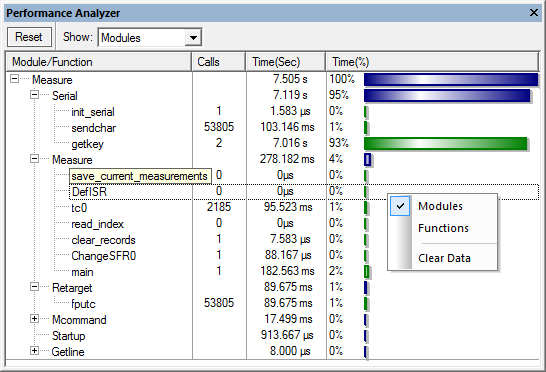 The Performance Analyzer shows execution statistics, like time and number of calls of a function or module. Performance Analyzer requires a ULINKpro debug adapter to capture instruction trace (ETM) data. To enable tracing, follow the instructions on Configure Cortex-M Devices for Tracing. Statistics are collected for the complete program code. The Performance Analyzer displays the information collected by the Execution Profiler for known address ranges. This means, the list does not include information for address ranges without debug information, such as the floating point library of the ARM RealView toolset. Results are displayed as bar graphs, along with call and time information. The list sorts itself automatically after a few seconds. Thus, the most time consuming modules or functions are displayed at the top of the list. A context menu can be invoked by clicking the right mouse button. This menu offers the possibility to switch between the modules/functions representation of the statistics. Also, the collected statistics can be cleared from here. Double-click a function name to jump right to the code of that function. Button that clears recorded statistics. Pressing Reset while the target is running could produce inaccurate data. The total Time may not reach 100% in this case. It is recommended to stop the target before resetting the view. Switch the list of statistics based on the selection. Lists the name of the module or function. Shows how often the module or function was called. Shows the time, in micro-seconds, spent in a module or function. Shows the time, as a percentage of the total time, spent in a module or function.